Lots of clinical white, dashes of wood, and lots of marble and ceramic. This is the big look dominating 2018 bathroom renovation trends. The shower has also made a big comeback in favor of environmental consciousness. Interior designers are pushing space utilization to new limits with open bathrooms and sparse furnishing and lots of transparent glass. If you are looking to do a bathroom renovation, here are the bathroom trends to try in 2018. 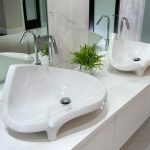 Ceramics have long dominated in the bathroom as the preferred material for sinks, bathtubs and toilet bowls. But the style is changing with more variety in breaking from the traditional plain white. New geometric patterns and multicolor tones are moving ceramics to more decorative positions. Marble has become a hot commodity for high-end bathrooms. The bathroom is becoming a favorite spot for relaxation and blowing off steam. It is even becoming a social spot with two or three congregating to make up, compare notes and small talk. This has demanded more space, which has brought up the concept of the growing or movable bathroom. The illusion of a bigger space is created by using bigger tiles, larger mirrors, and clever storage utilization. Going together with the need for making space look larger is the need for more storage. These two contradicting needs are being met with more functional modular furniture. It can be packed away and installed as needed. More drawers, shelves, and cabinets can be had on demand. These pieces are coming in simple and straight shapes. A popular choice is self-supporting vanities without legs. While the clinical clean look is all-time popular in the bathroom, adding a touch of warmth makes it ideal for relaxing. Earthy colors and neutral tones add this touch of warmth. Adding multi-colored tiles tones down the surgical look. A touch of natural colored wood for the bathroom cabinetry and earth colored wallpaper makes the bathroom has a marked effect on the ambiance. The shower is always a smart choice for cramped space. The Italian minimalist shower featuring large transparent glass doors can be fitted in the modest apartment. A multi-functional shower is also an attractive option for its practicality; integrating a steam system, antifog and ambient mirrors, soap and gel dispensers, a bench and other useful elements in the shower. The bathroom has not escaped the tech wave. Dimmable LED lighting, touchscreen mirrors, motion detectors enabled valves and towel dryers are some of the tech taking over in the bathroom. Would you like to change the look of your bathroom? Talk to Bow Valley Kitchens for trendy options that will transform your bathroom today.